"We are proud to partner with The Entrepreneurs Center to deepen our commitment to the Dayton community as an anchor tenant of this historic and important downtown space," said UD President Eric F. Spina. "Our innovation hub will fuel economic growth and spark creativity by enabling students, faculty and staff from across campus, including engineers, artists and business majors, to work alongside local entrepreneurs. As a Marianist university, we believe in community and we know this project will make the Dayton community stronger and enhance the quality and impact of UD’s educational offerings. The Arcade Innovation Hub gives us the opportunity to be an essential part of the city and for the city to be part of us." Small businesses, startups, and entrepreneurial thinkers from all corners of the region will be able to take advantage of working space in the 95,000-square-foot innovation hub through co-share membership, giving them access to anything from open desks to private offices along with meeting rooms, conference areas, high-speed internet and other amenities. "We are thrilled to formalize our longstanding partnership with UD. Together, we share the vision of reinvigorating this historic space to offer one of the unique environments in the country," TEC President Scott Koorndyk added. "Over the last few years, we’ve seen incredible synergies between Dayton-region startups and UD students, faculty and staff from across almost every discipline. The innovation hub builds on that foundation, and will give students unparalleled opportunities for real-world, hands-on experience. It will also give our local companies access to the energy and insight of these talented Flyers." Spina said while the investment will help the urban core, the driving force for the University is to create a space for cutting-edge academic programs that will foster the creative mindset and entrepreneurial skills today's students want and employers seek. Hundreds of students from UD's entrepreneurship, engineering, applied creativity, and art and design programs will engage in the space. UD will locate its L. William Crotty Center for Entrepreneurial Leadership in the hub, along with studios for painting, printmaking, photo and graphic design; a makerspace area; gallery space; a new venture from Flyer Enterprises, the fourth-largest student-run business in the country; and the University's GEMnasium, where faculty, students and community members can work across disciplines to address important challenges in the community, such as the opioid crisis and food insecurity. TEC will use the hub as its central location, and from there will provide comprehensive business and commercialization support services to entrepreneurs, startups and early stage companies from across the region. In addition to support for technology companies, TEC will locate its Small Business Development Center in the hub, providing access to support for entrepreneurs of all types. Additionally, as part of the community benefit plan, UD and TEC will host programming in the community, including the University's Flyer Pitch competition, one of the largest business plan competitions at the collegiate level; Dayton Arcade Entrepreneur Academy; summer internships; and opportunities to participate in other competitions and TEC and UD entrepreneurship programs. "The energy generated by the Arcade Innovation Hub will be a game changer for downtown and the regional economy, creating new jobs and businesses," Bill Struever, principal, managing partner and CEO of Cross Street Partners said. "We are particularly excited by TEC and UD's deep commitment to make the Hub a focal point for maximizing education, workforce and entrepreneurship opportunities for the broader Dayton community. This embrace of Dayton's diverse array of neighborhoods resurrects the Arcade’s important historic role in the life of the city." Through the partnership, UD and TEC plan to invest more than $10 million over 10 years to cover rents, operating expenses, upfront costs for furnishing and equipping the space, and other equity support for the project at closing. The partnership expects income from sub-tenants and hub members to offset some of its investment. "If not for this long-term investment, the Arcade project would not have happened; we greatly appreciate their support and partnership," said Shelley Dickstein, Dayton city manager. "We are excited to see both the University of Dayton and The Entrepreneurs Center deepen their commitment to our community through this agreement. 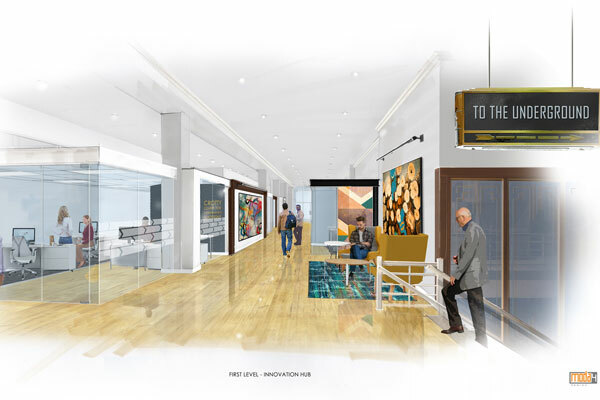 As anchor tenants, both will enable the Arcade to be reimagined as a hub of innovation for entrepreneurs, higher education, and arts and cultural organizations, which will catalyze economic activity in Dayton for years to come." Bruce Katz, a leading international expert and advisor on urban policy and redevelopment, has high praise for the project as well. "The historic Arcade project in Dayton, Ohio, may be the most transformative project in the United States today," Katz said. "The Arcade has the potential to spur a dramatic revitalization of the core of the city through its distinctive combination of strategic location, shared investment, historic legacy, civic pride and innovative concept."